Coos Bay, Oregon — The jobs are coming, so Ocean Power Technologies insists. OPT spokesman Len Bergstein said Monday the company wants to get stimulus funds from the federal government. “We have a strong interest in presenting a project that would be jobs-ready right now,” Bergstein said. OPT wants to get a test buoy in the water soon. It recently formed an agreement with Lockheed Martin in which Lockheed would provide construction, systems integration and deployment work, according to a press release. The announcement last week followed on a similar report from Oregon Iron Works in Clackamas and American Bridge in Reedsport that said they plan to share buoy construction work, if Oregon Iron gets OPT’s contract. Bergstein said the Lockheed agreement is for higher level technical, systems integration work. “It would not replace work on the coast,” he said. OPT has said it hopes to get a buoy in the water this year and to submit plans to the Federal Energy Regulatory Commission and the federal government in March. The Obama administration recently put together the White House Task Force on Middle Class Working Families, chaired by Vice President Joe Biden, to boost the living standards of the country’s middle class. Its first focus is green jobs, those that use renewable energy resources, reduce pollution, conserve energy and natural resources and reconstitute waste. The task force’s first meeting is Feb. 27. If the community can get behind OPT’s plans, Bergstein said, the company could submit it to the task force. Coos Bay — The announcement came as a surprise to everyone. The Federal Energy Regulatory Commission’s Thursday order issuing a preliminary permit for a 200- to 400-buoy wave energy project off of Newport shocked Ocean Power Technologies leaders as well as the public. What’s different about this project is that FERC’s approval stirs up a hornet’s nest at the time OPT is trying to work with residents on the South Coast for community approval of two sites: a 10-buoy project off of Gardiner and a 200-buoy project off of the North Spit. It also calls into question FERC’s intentions of adhering to a memorandum of understanding previously negotiated with Oregon to give the state greater siting power over wave energy projects in the territorial sea. The approval also seems to be designed for FERC to flex authority over territory traditionally overseen by the U.S. Department of Interior’s Minerals Management Service. Both agencies have claimed the area outside of Oregon’s territorial sea, beyond three nautical miles. As the FERC notice of approval hit residents’ e-mail inboxes late Thursday, outrage began to build. OPT applied for the permit in November 2006, but let the application slide. The jurisdictional battle meant the application was going nowhere fast. 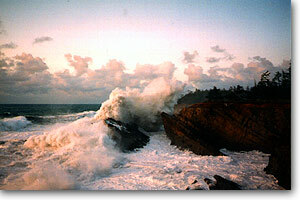 OPT decided to concentrate its work on the Gardiner and Coos Bay sites, both of which are inside the territorial sea. Bergstein said as soon as he found out about the approval, he immediately called Lincoln County Commissioner Terry Thompson and other Lincoln County folks, particularly those involved with the Fishermen Involved in Natural Energy group. “Clearly, we have not been prompting FERC,” Bergstein said. Bovett, who was involved in the commenting on the original OPT application, said Fishermen Involved has been working with wave energy companies to determine the best sites for development that would have the least impact on the fishing industry and local communities. This, though, was different. “FINE wasn’t involved in the selection of this box,” Bovett said. Bovett’s first question was: Does the memorandum of understanding not mean anything? Bovett just chuckled. According to the deal, he said, FERC wasn’t going to issue permits willy nilly. Some of the discrepancy over the decision to issue a preliminary permit — which allows OPT to only study the area for feasibility — may be because Oregon hasn’t finished updating its territorial sea plan. The Ocean Policy Advisory Council and the state have been working on it, but the marine reserves issue has dominated the council’s time over the past year. “This will obviously get everybody’s attention,” Southern Oregon Ocean Resource Coalition Chairman Nick Furman said of FERC’s decision. Whereas the Reedsport and Coos Bay sites are considered by some to be ground zero as far as local communities negotiating with wave energy developers, the Newport site could be ground zero for state vs. federal and agency vs. agency jurisdiction and siting battles. However, Bovett said, OPT holds the key right now. 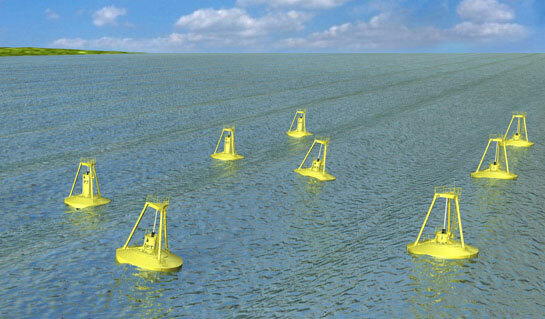 The New Jersey-based wave energy developer should withdraw from the site, he said. Otherwise, years of litigation seem likely — and courts ultimately would have the final say over which agency should be in charge of alternative energy. Editors Note: On May 11, 2009, PG&E pulled-out of Mendocino WaveConnect, read it here: http://tinyurl.com/qwlbg6 . The remains of the $6M are now solely allocated to Humboldt WaveConnect. PG&E caught a major renewable energy wave today as the California Public Utilities Commission approved $4.8 million in funding their centerpiece wave energy project, WaveConnect. The program also received an additional $1.2 million in matching funds from the Department of Energy. PG&E’s WaveConnect, a project already two years in the making, launches with a $6M kitty. 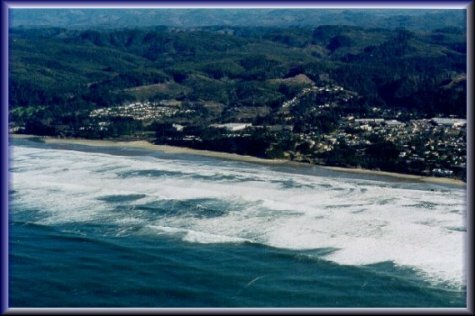 WaveConnect is chartered with exploring wave energy development off the coasts of Mendocino and Humboldt counties in Northern California. The stakeholders in this region are dyed-in-the-wool political activists, living in environmentally-centric coastal communities and have reacted protectively, sounding alarms that PG&E and the Federal government’s wave energy plans may foul, diminish and destroy the Pacific Ocean and marine life. Over the two years that PG&E and the Federal Energy Regulatory Commission (FERC) advanced WaveConnect, only recently have environmental concerns and study become part of the discussion. The opportunity for Mendocino and Humboldt coastal communities and local governments to embrace wave energy development and connect with WaveConnect has not gone well, especially as the Federal Energy Regulatory Commission (FERC) has disallowed the City of Fort Bragg and local fishermen to be party in the WaveConnect FERC Preliminary Permitting. “The anticipated cost of wave power compares favorably to the early days of solar and wind,” says William Toman, WaveConnect project manager at PG&E. “It will take several stages of design evolution to lower costs and increase reliability.” The CPUC and the DOE are betting on this evolution as in this funding scenario engineered by PG&E, the CPUC awards $4.8M in ratepayer funds while the DOE $1.2M is a matching grant. 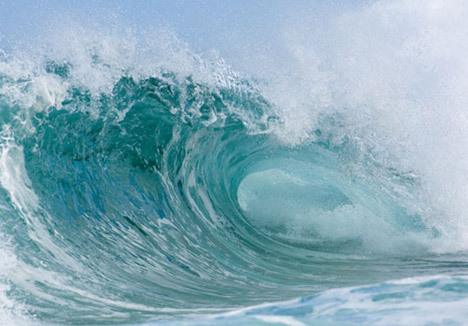 Wave energy may become a key source of renewable energy in California. It’s proposed that the 745-mile coastline could produce 1/5th of California’s energy needs if, admittedly a big if, economic, environmental, land use and grid connection issues — and community issues — don’t stand in the way. Please Take Action By MONDAY, FEBRUARY 9, 2009 before 2:00 pm! Just a couple of weeks ago, Ann Miles, Director of Hydropower Licensing at the Federal Energy Regulatory Commission visited the Mendocino coast. The centerpiece of her presentation on January 13, 2009 at Fort Bragg Town Hall was to explain the FERC Hydokinetic Licensing process. For all those present at the meeting, Ms. Miles informed the Mendocino community of the WRONG DATE to file citizen Motions to Intervene in the Green Wave LLC proposed FERC project on the Mendocino village coastline. FERC has kindly updated the mis-information and has indicated they wish to have the correct date promoted. This correct date to file Motions to Intervene (directions follow) is now Monday, February 9, 2009 no later than 2:00 P.M. PST. Here’s a novel and effective way for you, your company and your family to state your position to the Federal Government on Mendocino wave energy development. It’s pretty simple to do, it’s empowering and it’s effective in that each filing can make a difference. Interested? Read on. This action relates to Green Wave Energy Solutions’ application for a wave energy Preliminary Permit that was recently accepted by the Federal Energy Regulatory Commission (FERC). Since early December 2008, FERC has enabled a process for the public and interested parties to share their views (intervene). The best way to participate is go online to the FERC web site and use the guide below to share your views on the Green Wave FERC hydrokinetic application. Click on this HERE for a step-by-step instruction guide authored by Elizabeth Mitchell, FERC Coordinator for Fishermen Interested in Safe Hydrokinetics, FISH. An application for a wave energy project in the ocean off Mendocino, California has been filed by Green Wave Energy Solutions, LLC. Green Wave has made an application to put 10 to 100 wave energy devices in 17 square miles of ocean, between 0.5 and 2.6 miles offshore, running roughly north and south between the Navarro River and Point Cabrillo on the North Coast of California. The law provides that interested individuals and organizations may become parties to the permit process. In order to become a party, you and/or your organization(s) must file a “Motion to Intervene.” The deadline for intervening in the Green Wave Project is Monday, February 9, 2009 by 2:00 P.M. PST. You may intervene no matter what your current views are on the merits of wave energy. Intervention gives you a place at the table as a full party to the permit process. It also enables you to appeal future FERC rulings with respect to the permit. Intervening is not difficult, and you do not have to be a lawyer to do it. If you file your motion to intervene by the Monday, February 9, 2009 deadline, and no one opposes your intervention, you automatically become a party after 15 days.